Cyclone Warning Class 2 in Force in Mauritius – S4ndeep – lOve ever… sozZz never…. S4ndeep – lOve ever… sozZz never…. I was in the Communications Skills Class and it was nearly 4pm(time to end the class), and Some guys came from outside and said its class 2, the lecture ends here. Damn!! Couldnt they have come earlier?? nevertheless… the lecture was damn interesting! So i walked in the rain… as much as i could. My friends say i am crazy.. i dragged them too.. 🙂 In front of Mc Donalds, i saw a girl, she resselbled a girl that i knw , and i touched her hand.. and damn! it wasnt her!! 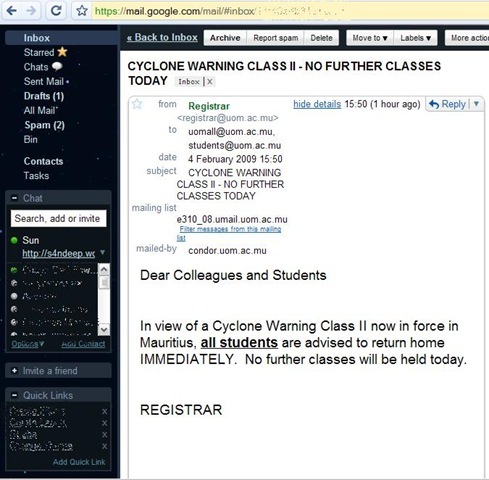 When its Cyclone Warning Class 2, Schools and Uni release because Class 2 is considered as dangerous. Right? So yeah.. release the students in the dangerous weather itself! 🙂 Wot an intelligent decision!! Franc Franc tou!! Outcome : All Schools and Uni’s are released simultaneously, with consequence : MASSIVE TRAFFIC JAM!!! When i saw MASSIVE, I MEAN MASSIVE. From rochebois to port louis. Cars are moving like snails. And finally when i came home! The joke of the day!!!!!!!!!!!!!! Check this out! Seriously?? How was this supposed to inform me while i was in class?? Its nice that the use mass mail to communicate to students.. but come’on!! For those who come from Mars, The name of the Cyclone is Gael and its coming head on MRU. I say, come baby come..
And Miss Chaya says i cant shine… there’s cyclone.. But i guess i’l continue to shine! in ur msn contact list! 😀 Jai ho! Hahaha… kan dimoune fini rent lakaz lerla zot avoy email sa ban la lol. Till what time will the cyclone be here tomorrow? And yeah.. You dragged me and Yasir in the rain. But it was fun..
sun, lol.. 1 lepok mti p criyer toi weather boi.. ena chance met class 3??? @Star03, I dont think so. but i hope so. 🙂 zeenat pu sonne petard. Tassy on Taboo? Mauritian Mentality? ?